By Dennis W. Viau; from a Rhode Island restaurant. What can you do with leftover steaks? Many years ago I occasionally ate lunch in a restaurant near Westerly, RI. They had the best steak sandwiches. When I had leftover steaks from a video/TV show, I thought of these sandwiches. 1 or 2 steaks, depending on size, preferably medium-rare, sliced very thin. Optional: Butter for the toasted bread. Cut the onion half in half again (effectively quartering the onion) and then slice it into short julienne. Heat the oil/butter in a skillet over medium-high heat and sauté the onion until lightly caramelized, reducing the heat as the moisture in the onions cooks off. This could take 15 to 20 minutes and toward the end of the cooking, the heat could be reduced all the way to low. The onions should be a golden color. While the onion is cooking, slice the steak very thinly. A good sharp knife is essential. Also slice the mushrooms. Heat the oven broiler. Cut a baguette loaf in half, separating the top from the bottom, and place on a baking sheet. You can trim the top of the baguette a little if necessary to prevent it from rolling. Toast the baguette under the broiler until golden. When the onion is done, transfer to a bowl and set aside. Melt the whole butter in the skillet and add the sliced mushrooms. Sauté over medium heat until tender, 2 to 3 minutes. Add the sautéed onion, sliced beef, and 1 or 2 tablespoons of broth to the pan. Heat only until the beef is warm enough to eat. Don’t overheat, as this would cook the steak further and make the meat tough. Arrange 2 slices of cheese on each toasted baguette. (You can butter the toast if you prefer.) Spoon the beef mixture onto the sandwich. Heat the remaining broth and pour into individual dipping bowls, such as ramekins. 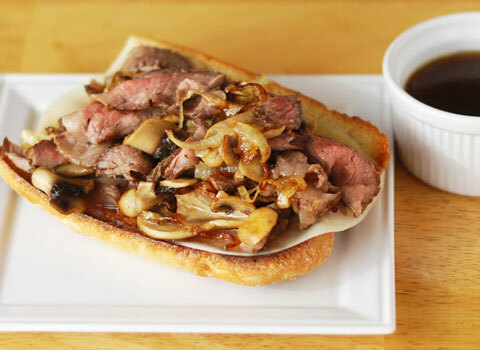 Serve the sandwich with the au jus dipping sauce on the side. My Cheater Beef Stock: Combine 1 cup (237ml) heated chicken stock with 1 to 2 teaspoons beef bouillon.